There are countless roofing options for countless budgets, but a little research reveals why metal roofs are superior and often the right choice. 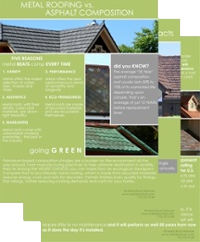 For a comprehensive look at metal roofing that includes comparisons to other popular roofing materials, download our FREE re-roofing booklet. Metal roofs are available in more styles, profiles, colors and patterns than any other roof material. Regardless of your architectural style, you can find a complimentary metal roof that will look beautiful and out-perform the competition. It's a common misconception that metal roofs only come in long, vertical panels. Of course, they do, but that's just the beginning. Browse the photos in our tile, shake and shingle galleries, and you may be surprised at the beauty and versatility of metal roofing. Nothing lasts forever, but the right choice of metal roofing can endure for many lifetimes. Just take a look at the roofs topping countless famed cathedrals and castles in Europe and historic buildings like Thomas Jefferson's Monticello or the Washington Monument - all examples of metal roofs lasting centuries. If priorities for your roof include low maintenance and longevity, metal should be one of your first choices. Thanks to their light weight and range of profiles, the metal roofing category offers building owners more choices than any other material - particularly for a re-roofing project. There are very few materials that go over existing roofs as successfully as metal. In fact, metal is one of the only materials that can over nearly any existing roof assembly. Add to this technical benefit a range of beautiful options, and you have the perfect material for replacing an old or failing roof and upgrading the entire building at the same time. No roof can guarantee that a house won't catch fire, but incombustible metal roofs can eliminate the roof as a fire risk. Metal roofs are also smart choices in earthquake-prone areas thanks to their light weight and rigidity. Consider this - even the lightest of asphalt shingles is nearly double the weight of an average metal roof, and a standard concrete roof weighs in at 15 tons! Imagine that overhead when the walls start shaking. Another big advantage of a properly configured metal roof is tremendous resistance to high winds. In fact, there is no better material for resisting the damage of extreme weather. Because metal roofs are mechanically fastened and don't rely on a rapidly aging adhesive like an asphalt roof (which is why wind warranties on asphalt roofs all expire after only five years! ), they are the most durable material for all weather conditions. All of our metal roofs are manufactured with a significant percentage of recycled material, closing the loop for efficient use of materials, and they offer assemblies that dramatically reduce the amount of heat accumulated in an attic, making them very energy efficient. While some of our finishes are Energy Star certified, all our metal roofs offer exceptional longevity, lowering life-cycle costs and the impact on our diminishing landfills.